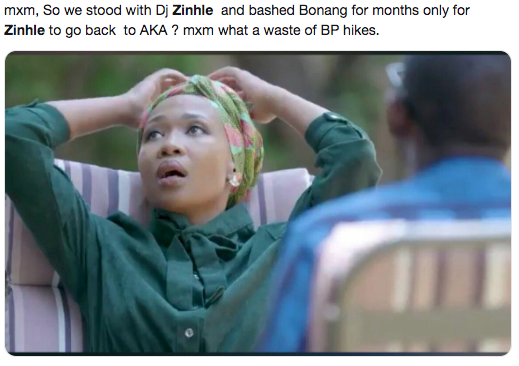 Ever since word got out that DJ Zinhle and AKA may have officially rekindled their romantic relationship, people have been up in arms as they question why she's gone back to dating the rapper. 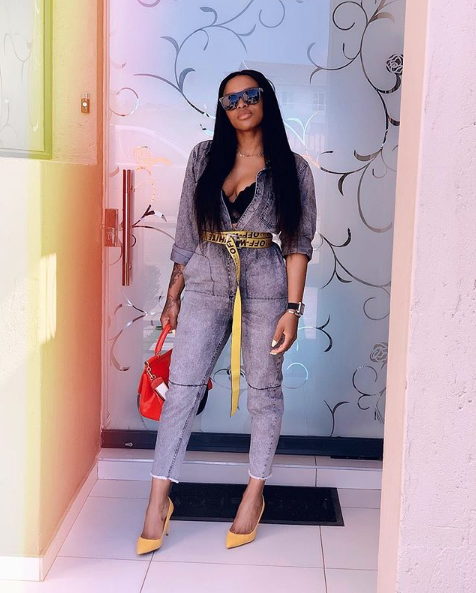 In 2015, DJ Zinhle shocked South Africans when she revealed in a statement on her website that the father of her child (AKA) had been cheating on her with media darling, Bonang Matheba. In the statement, she wrote: "I have recently been confronted with a situation that forced me to think really hard about the kind of woman that I want to become and the kind of legacy I want to leave behind. "A week before our daughter was born, I found out about an affair between Kiernan (father of my child) and Bonang Matheba. I also received confirmation of all rumours through an honest conversation which I had with Kiernan, who confirmed that the affair had been going on for over 5 months." After the release of the statement Zinhle, received an unwavering amount of support from fans and people alike as they sympathised with her, especially considering that she had just given birth to their daughter, Kairo. The support has continued ever since. However, when speculations surrounding her rekindled relationship with AKA surfaced, people expressed their disapproval of the reunion. Those who had stood in solidarity with Zinhle were really disappointed. 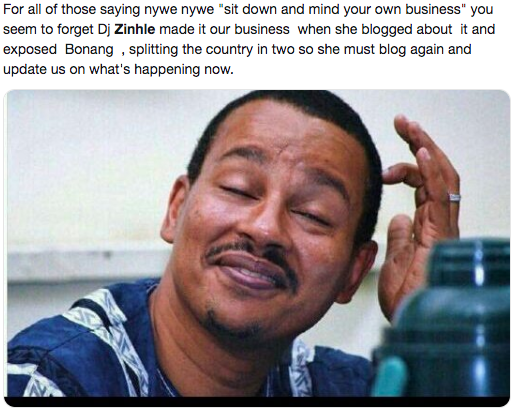 Zinhle's defence force has been urging people to just mind their own business. However, there are those who also reminded Zinhle's defence force that the DJ is the one who brought her business to the public's knowledge. It's hilarious how others think that DJ Zinhle betrayed them, really? 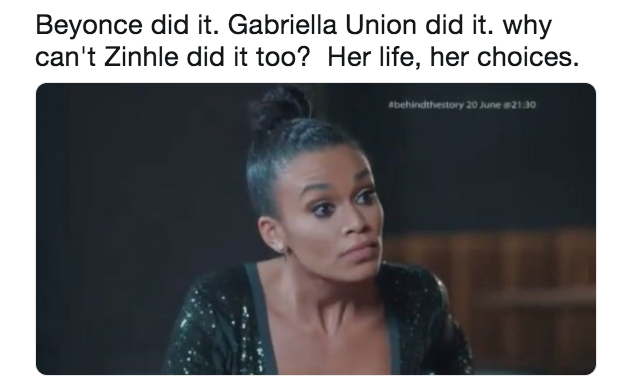 Meanwhile, Zinhle's supporters have been hard at work defending her and comparing her situation to other female celebrities who have taken back their cheating partners. It was also interesting to witness how some people defended Zinhle by pinpointing the faults in other people's relationships. "Ya'll been put through the most by your partners but you're judging Zinhle," said one Twitter user. "Oksalayo Zinhle and AKA are happy, hlala wena with your n*** that takes you to Hartebees," said another Twitter user. Hawu, but guys, what's wrong with having your partner take you to Hartees? And for some reason, we kind of knew that other people's poor parents would be dragged into this debate. "I hate what you people are doing to Zinhle , mind your business like you did when your mom forgave your father for cheating on her for the 100th time,"
wrote another individual who has been in full support of Zinhle's decision. The interesting part about this entire debate is that AKA and Zinhle are probably watching all of this unfold whilst they continue to enjoy their vacation and planning on ways to make even more money in 2019. It's funny how this life thing works, right? Love DJ Zinhle? You can read more about her here.